Is Contae é Ciarraí ina bhfuil dhá cheantar mór Gaeltachta, i gCorca Dhuibhne agus in Uíbh Ráthach, mar aon le pobal suntasach Gaeilgeoirí atá ag dul i méid sa chuid eile den gContae. Ceantair shaibhre iad na Gaeltachtaí ó thaobh teanga, traidisiún, scríbhneoireachta, béaloidis, ceoil, suímh stairiúla agus seandálaíochta, áit a bhfuil an Ghaeilge fós beo mar theanga phobail. Sí seo agus tobar na Gaeilge do phobal na hÉireann agus an diaspora fud fad an domhain. 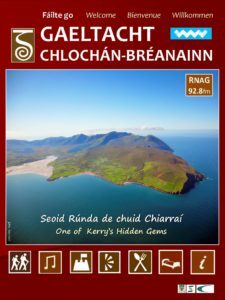 Kerry is a County in which there are two large Gaeltacht areas, in West Kerry and in South Kerry, as well as a significant and growing Irish speaking community in the rest of the County. These Gaeltacht areas are rich in language, tradition, writing, folklore, music, historical and archaeological sites but more importantly, these Gaeltacht areas are the cradle of the Irish Language, areas where Irish is still the living language of the community and must therefore be protected and nurtured.